Are you ready to shred like a girl? 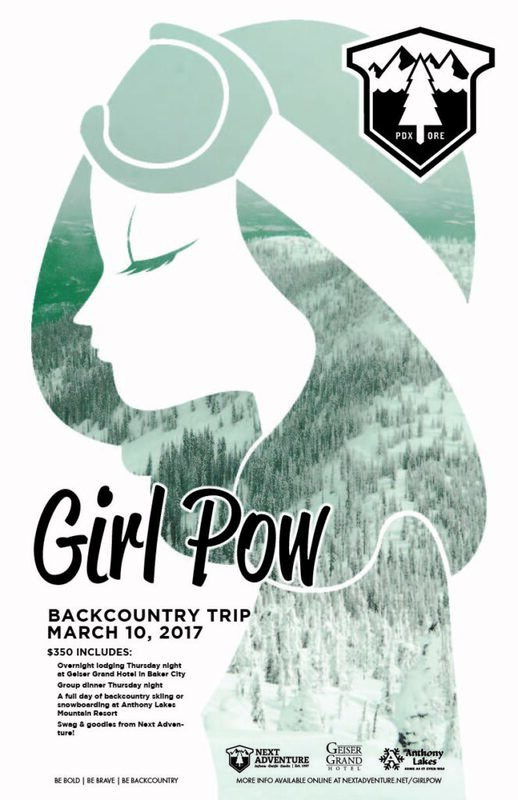 Because the Girl Pow Back Country CAT ski & snowboard trip is back! With the highest base elevation in Oregon, Anthony Lakes has some of the best backcountry riding in the state. We're heading there to tap into some fresh, beautiful, untouched pow. On Thursday, we’re spending the night at the Geiser Grand Hotel in Baker City where we’ll get to know each other over an awesome dinner - on the house. We’ll get up early Friday morning for a full day of CAT backcountry skiing and snowboarding starting at 7AM sharp! - Transportation isn’t included, you’ll have to get to Baker City on your own. - Lodging is included! You’ll stay at the beautiful Geiser Grand Hotel, we’ll assign rooms unless you’re with already with a friend. - Dinner at the hotel on Thursday is on us. - Swag and goodies from Next Adventure! - Due to ungroomed conditions, we require an intermediate or higher skill level for this trip.